These meditative sealed cement sculptures bring peace, humor, and the art of Zen to off-kilter spaces. Garden greens looking a little blue? Is that unruly tangle of a yard making you lose your inner balance? Let Michael Gentilucci's centering sculptures bring peace, humor, and the art of Zen to off-kilter spaces. 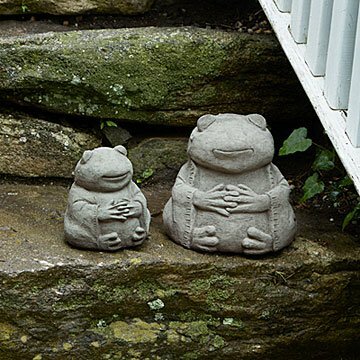 These adorable amphibians add a necessary splash of tranquility to outdoor spaces through their calming, yet distinctively froggy presence. To add even more Zen-like charm, Chinese characters etched into the back of each frog's robe represent the animal's primary characteristic—success. Michael's meditative sealed cement sculptures are designed to weather the elements through the four seasons as they center greenspaces with their amiable auras. Handmade in USA. Michael and Alisa Gentilucci were relaxing in their garden amidst planters and garden accents, contemplating their future together. The next year, they launched a business. “We began making molds in our garage and soon realized we were onto something,” says Michael. They bought a property with a dilapidated Victorian cabin, some crumbled out-buildings, and an unfinished warehouse, and turned it into their garden shop, studio, and home. Michael designs the company’s expressive, inspirational garden art, and enlists the talent of local artists to sculpt it. "The positive response we receive from these spirited designs is an extraordinary feeling," he says. "Our customers smile while holding our art, and tell us stories about who they intend to give this gift to." Standard: 4.5" L x 5.5" W x 5.5" H, 4.5lbs. ; Large: 7" L x 7.5" W x 7.5" H, 13lbs. Rinse clean with garden hose. Sealed with protectant for outside use. Love them! Put them in my flower box. I love this quirky frog sculpture. He is the perfect addition to my mom's garden, and she was so excited to receive him. Great detail and quality. They greet me near my driveway whenever i pull in. Always need a smile or two! This gift was well received by our co worker at her retirement. It was perfect! My wife loved it. She has a love of frog figurines and garden art. She had never seen any thing like it before. It's very zen and looks fantastic in her front garden. The small version of this frog sits on my mom's desk at work. She loves it.